Thanks to Juan Jose Seguara Fonseca, Laboratorio de Patologia y Citologia Diagnostica (Costa Rica), for contributing this case and most of the discussion. To contribute a Case of the Week, follow the guidelines on our Case of the Week page. Over 475,000 visitors joined us online last year. Did you? Laboratory Investigation is the basic pathology research journal with vast coverage of all biomedical disciplines in the pathology spectrum. (1) Thanks to Nikhil Sangle, M.D., University of Utah and ARUP Laboratories, for reviewing the entire B cell lymphoma chapter. We will be adding more images to this chapter over the next 1-2 months. (2) We are currently updating the Bladder and Stains chapters. A 43 year old man was seen at the outpatient clinic because of right flank pain and gross hematuria. On an intravenous pyelogram, a smooth, large filling defect was noted in the mid-ureter, accompanied by moderate hydroureter. The kidney and ureter were excised. 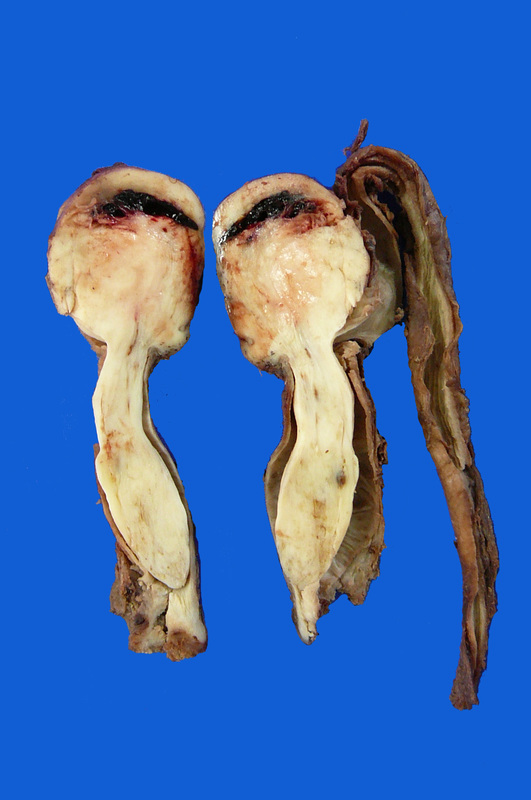 On opening the ureter, a large, elongated, white solid tumor filled the entire ureteral lumen attached to its wall. Microscopic examination disclosed a spindle cell proliferation of cells with eosinophilic, fibrillar cytoplasm and blunted, regular nuclei. No atypia, mitotic figures or necrotic foci were seen. 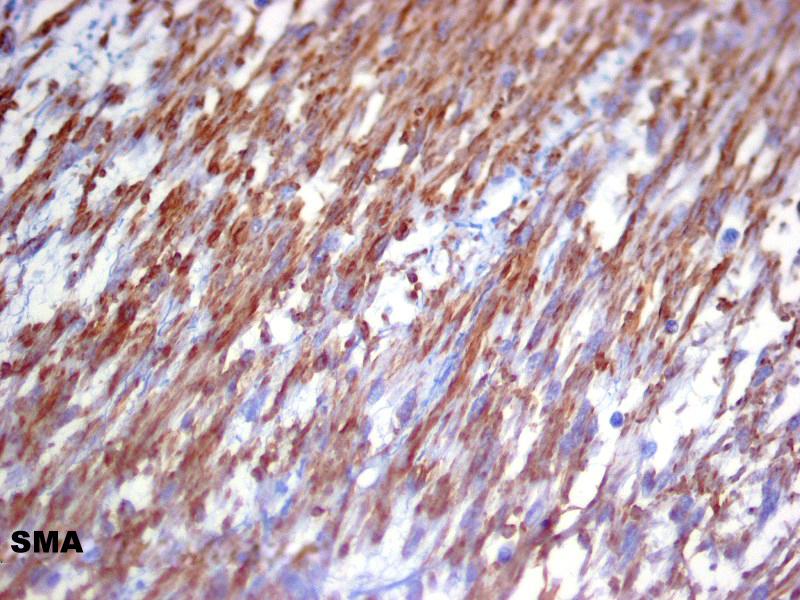 There was strong cytoplasmic immunoreactivity for actin and smooth muscle actin. S100 and CD34 (not shown) were negative. Primary ureteral tumors are rare and account for only 1% of all upper genitourinary tract neoplasms. Benign ureteral lesions are even more rare, representing 20% of all ureteral tumors (1). Nonepithelial benign mesodermal tumors are the rarest, comprising less than 3% of all primary tumors of the ureter. They include fibroepithelial polyps, which are the most common (2), solitary neurofibromas (3) neurofibromas associated with von Recklinghausen disease (4) and sporadic primary hemangiomas (5,6). Only 12 cases of primary leiomyomas of the ureter have been reported since Leighton's initial report in 1955 (7-18). The patients were usually in the 4th to 5th decades of life, with only two cases in children (9-16). Two thirds of these cases were in males. 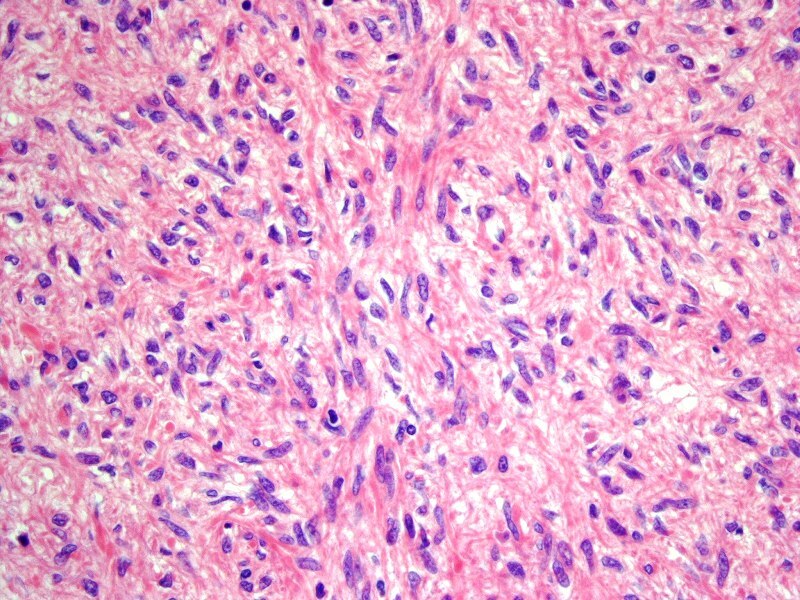 One case was associated with multiple endocrine neoplasia Type 1 (15). Clinically, most patients presented with hydroureter, hydronephrosis, flank pain with hematuria, ureterocele or blood clot retention (10,14). Most ureteral leiomyomas are located within the ureteral lumen in continuity with the muscle wall, without extension to the renal pelvis. 1. Tanagho EA, McAninch JW. Tumors of the ureter, in Smiths General Urology. Sixteen Edition, McGraw-Hill Companies, Inc., 2004. 2. Turunc T, Kuzgunbay B, Canpolot T. Ureteral fibroepithelial polyps with calculi: a case series (J Med Case Reports 2008 Aug 26;2:28). 3. Blum MD, Bahnson RR, Carter MF. Urologic manifestations of Von Recklinghausen neurofibromatosis (Urology 1985;26:209-217). 4. Varela-Duran J, Urdiales-Viedma M, Taboada-Blanco F, Cuevas C. Neurofibroma of the ureter (J Urol 1987; 138:1425). 5. 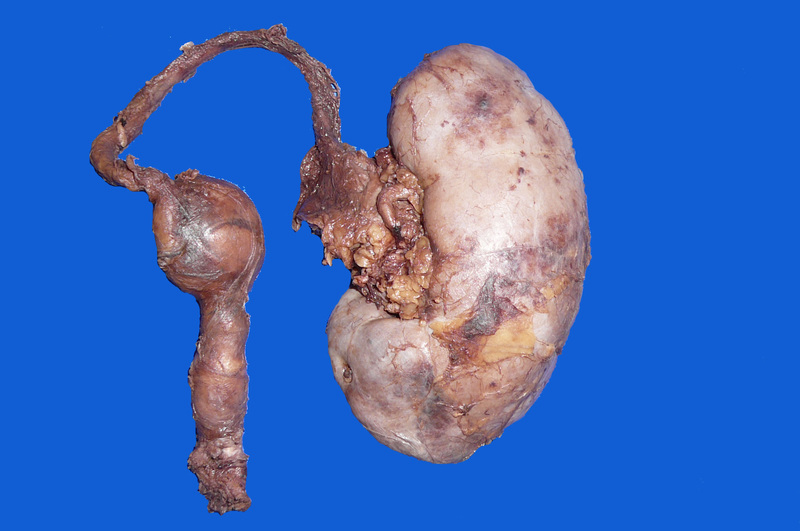 Maestroni U, Dinale F, Frattini A, Cortellini B. Ureteral hemangioma: a clinical case report (Acta Biomed 2005;76:115). 6. Kim SJ, Jincho H, Ha US, et al. Cavernous hemangioma of the ureter (Korean J Urol 2009;50:192). 7. Leighton KM. Leiomyoma of the ureter (J Urol 1955;26:256). 8. Kao VC, Graff PW, Rappaport H. Leiomyoma of the ureter. 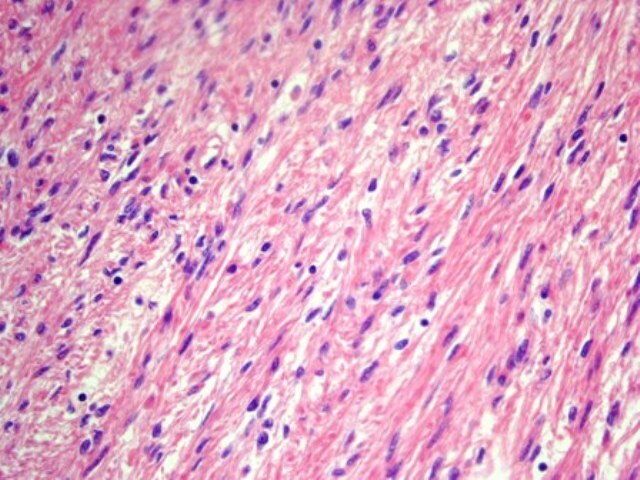 A histologically problematic rare tumor confirmed by immunohistochemical studies (Cancer 1969; 24:535). 9. Mondschein LJ, Sutton AP, Rothfeld SH. Leiomyoma of the ureter in a child: the first reported case (J Urol 1976;116:516). 10. Sekar N, Nagrani B, Yadov RVS. Ureterocele with leiomyoma of the ureter (Br J Urol 1980;52:400). 11. Zaitoon MM. Leiomyoma of the ureter (Urology 1986;28:50). 12. Cussenot O, Teillac P, Billebaud T, Roge P, Cortesse A, Le Duc A.Leiomyoma of the urinary excretory tract (Ann Urol (Paris) 1989;23:305). 13. Yashi M, Hashimoto S, Muraishi O, Tozuka K, Tokue A. Leiomyoma of the ureter (case report) (Urol Int 2000;64:40). 14. Shah SA, Ranka P, Dodiya S, Jain R, Kadam G. Leiomyoma of ureter- a rare cause of intractable hematuria and clot retention (Indian J Urol 2004;20:181). 15. 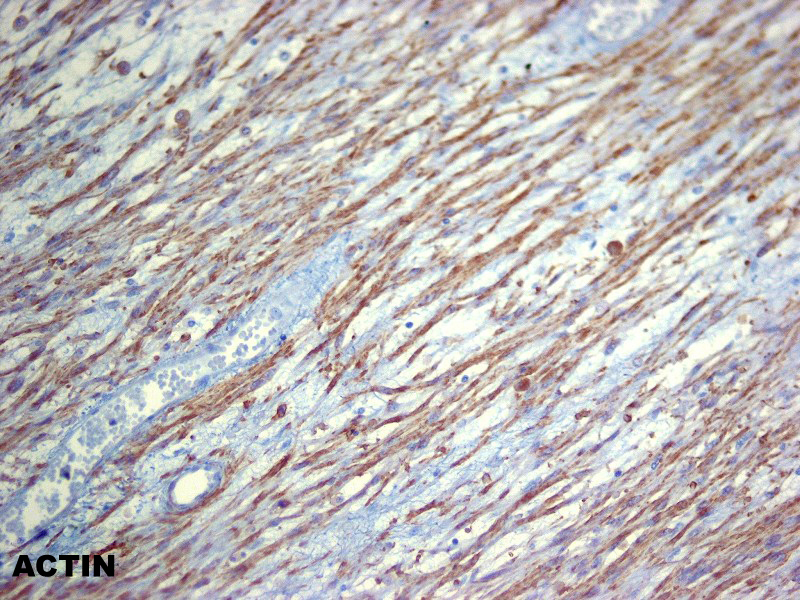 Ikota H, Tanimoto A, Komatsu H, Ozawa Y, Matsushita H. Ureteral leiomyoma causing hydronephrosis in Type 1 multiple endocrine neoplasia (Pathol Int 2004;54:457). 16. 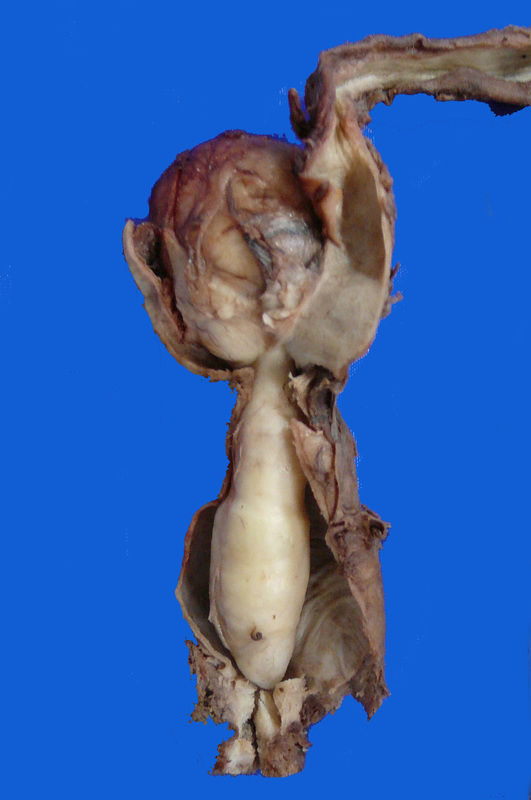 Cobanoglu B, Ozercan IH, Yalcin O, Ergin E. Leiomyoma of the ureter in a child. Case report (Turk J Med Sci 2004;34:345). 17. Naruse K, Yamada Y, Aoki S, Taki T, Honda N, Iwafuchi H. A case of primary leiomyoma of the ureter (Int J Urol 2007;14:248). 18. Nouralizadeh A, Tabibi A, Mahmoudnejad N, Taheri M, Torbati PM. Partial uretectomy for a huge primary leiomyoma of the ureter (J Pak Med Assoc 2010;60:62).